Rio Grande’s Mary Pica is congratulated by her teammates at home plate after hitting a fifth inning home run in Friday’s game one win over Carlow. The RedStorm swept a twinbill from the Celtics by scores of 12-2 and 1-0. 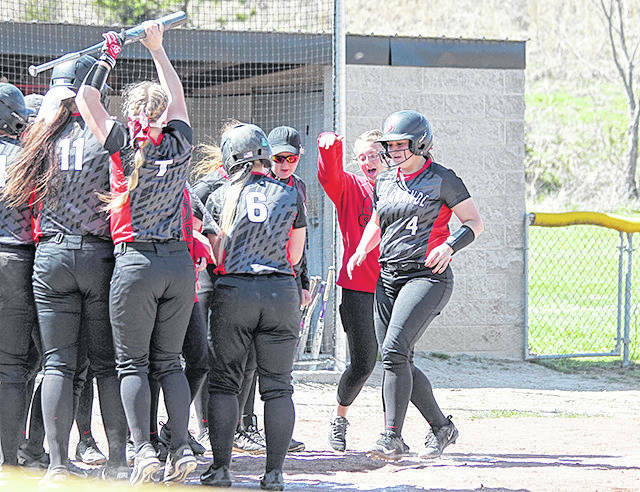 RIO GRANDE, Ohio — Friday’s sweep of a River States Conference softball doubleheader against Carlow University found the University of Rio Grande at both ends of the spectrum. The RedStorm used a pair of big innings to throttle the Celtics, 12-2, in the mercy rule-shortened opener of the twinbill, while a solid pitching performance from Mallory Powell fueled a 1-0 win in the nightcap at Rio Softball Park. Rio Grande improved to 28-11 overall and 12-2 in league play with the wins, putting itself back into a tie for first place in the RSC standings with Indiana University Southeast in the process. Carlow dropped to 13-12 overall and 5-7 in the RSC as a result of the sweep. The day started well for the Celtics, who touched up Rio junior starter Kelsey Conkey (Minford, OH) for two runs and four hits in the first inning of the opener. Carlow managed just two hits and no runs for the remainder of the day. The third of the four first inning hits — a single by Abby Tatgenhorst — gave the Celtics their 2-0 lead, but Rio Grande got a three-run home run from sophomore Michaela Criner (Bremen, OH) to highlight a four-run second inning which gave the RedStorm a lead they would never relinquish. Rio finished off the win by scoring eight times in the fifth inning. Freshman Mary Pica (Minford, OH) had a two-run home run, freshman Kayla Slutz (Navarre, OH) had a run-scoring double, Criner — the reigning RSC Player of the Week — had a two-run triple and Conkey hit a three-run walk-off home run to end the game. Criner finished 3-for-4 with five RBI, while Conkey had two hits and three RBI. Juniors Carly Skeese (Newark, OH) and Kelly Fuchs (Williamsport, OH) added two hits each in the win. Conkey earned her 14th win in 16 decisions in the pitcher’s circle, allowing four hits and the two runs while striking out three. Alysa Fairman had a double and took the loss as the starter for Carlow, allowing six hits and four runs over 3-2/3 innings. In game two, Powell — a senior from Flatwoods, Ky. and the reigning RSC Pitcher of the Week — walked two and tossed a two-hit shutout for her eighth win in 11 decisions. Both of the Celtics’ hits were infield singles — a bunt single by Kelsey Geyer in the third and a pinch-hit single to second by Tristan Voss in the seventh inning. Rio had just four hits of its own against Carlow starter Abby Stroud, two of which came when the RedStorm scored its run in fourth inning. Powell reached on a two-out single to right and scored all the way from first on a subsequent double to left-center by Pica. The second game took just an hour and 11 minutes to complete. Rio Grande returns to action on Saturday when it hosts Point Park University for Senior Day. First pitch for the opener is set for 1 p.m.